If you've not had the pleasure of having Maestro Doherty prepare you dinner, you have no idea what you are missing. AND if you get an invite to have Maestro prepare you dinner - GO. You will not be disappointed!! 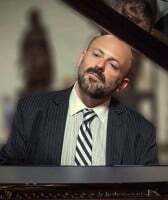 From time-to-time Maestro will be sharing some of his favorite recipes as prepared by himself as well as others so be sure to visit this page often. "This recipe was shared with me by the legendary opera Diva, Licia Albanese. Licia is a dear, dear friend to me - she is like a grandmother to me. We had the honor of having Mme. Albanese teach master classes with our singers for several years in a row and she even stage directed 3 of our productions over the years - Merry Widow, Madama Butterfly, and Carmen. Every year that she was with us here in Florida, she stayed in my home and she would often times cook for us. What a treat!! 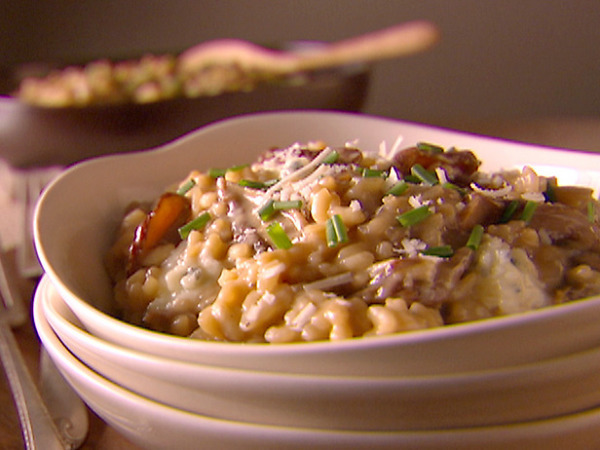 Our favorite dish was her fabulous risotto, so I've included it here. I hope you enjoy it. And don't forget to lift a glass of wine and toast to the great Licia Albanese. We love you Licia!!" This delictible dish takes advantage of the rich taste of Portobello mushrooms. However, white or brown mushrooms can be substituted. I generally make this as a main course and round out the meal with a green salad, but this makes an excellent side dish for roasted chicken, pork, or beef. 1. Cook the onions in 2 tablespoons olive oil and 2 tablespoons of butter over medium heat until soft. Stir in the garlic and rosemary and cook a couple minutes. Meanwhile, clean up the portobellos and dice them into 1/2-inch pieces. Turn up the heat and sauté the mushrooms with the onions. You may need to do this in 2 or 3 batches, so keep a big bowl handy for the cooked mushrooms. Set the mushroom/onion mixture aside for the moment. 2. Add a couple more tablespoons olive oil to the pot and stir in the rice until it is translucent. Then start adding the broth half a cup at a time. Stir well and adjust your burner so the broth simmers. Each time the broth cooks down to a thick sauce, stir in another half cup. When all the broth is gone, add the wine and the water. 3. When the rice is close to done, 15 minutes or so, stir in the mushroom/onion mixture and keep adding water until the rice is done. 4. When the rice is done, stir in the mascarpone or Parmesan. Salt and pepper the risotto to taste. Serve with grated Parmesan on the side. And of course a nice Italian wine. Combine beef, veal, and pork in a large bowl. Add garlic, eggs, cheese, parsley, pine nuts, raisins, salt and pepper. Blend bread crumbs into meat mixture. Slowly add the water 1/2 cup at a time. The mixture should be very moist but still hold it's shape if rolled into meatballs. (I usually use about 1 1/4 cups of water). Shape into large meatballs. 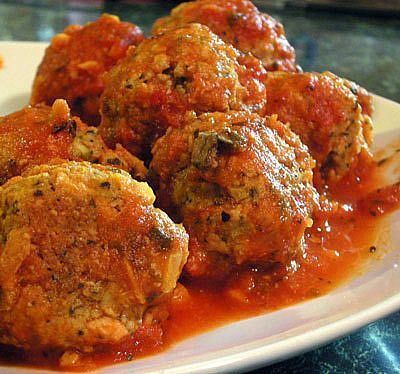 Place cooked meatballs into Marinara Sauce and cook for 30 more minutes.